Ranchi: Maoists, who have called for poll boycott, have silenced loudspeakers seeking votes in Jharkhand, where electioneering for the first phase of the assembly election ends at 3pm on Sunday. 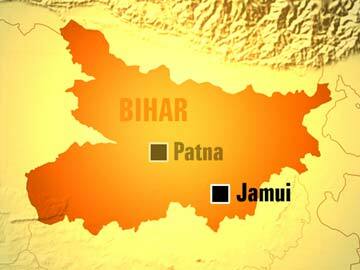 The extremists targeted election campaign vehicles and torched three, each of BJP, JMM and JVM(P), since Tuesday. They also warned party workers of serious consequences if they continue campaigning. Political parties were further disappointed after the district administration advised them against venturing into Maoist-hit areas in districts like Gumla, Latehar, Chatra and parts of Ranchi. “The administration, it seems, has given in to the Maoists. It is not possible for any candidate, let alone that of BJP, to seek votes on loudspeakers in interior areas. Candidates are avoiding going into interior areas. Even local party workers are afraid to go for canvassing,” said BJP’s state vice president Deepak Prakash. 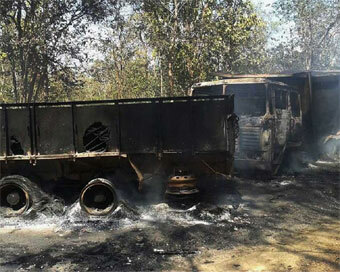 In Gumla, the campaign vehicle of BJP candidate for Bishunpur assembly segment Sameer Oraon was torched on Tuesday. “We have already informed the district administration about the problem,” said Oraon. BJP national vice president Raghuvar Das said he has received similar complaints from party candidates. Politicians whom TOI contacted on phone avoided talking on the issue. “One DSP told us not to go to the interior areas because police cannot provide protection to everyone,” said a local JVM-P leader seeking anonymity. He said recently a group of armed men stopped a group of JVM(P) workers going to Ghaghra on the border of Gumla and Lohardaga, and forced him to silence the loudspeaker and asked them to leave the place. JVM(P) Gumla district president Timbu Oraon said election campaign has been badly affected because of Maoists. The district administration has asked candidates to inform police about their campaign plans. Jharkhand police has asked Ranchi DIG Praveen Singh to camp in affected areas. “A 10 sq km area is badly affected in Gumla from where complaints came. I request all candidates to get in touch with us ,” said Singh. In the villages dominated by left wing extremists (LWE) in Jharkhand, the right to vote freely and without fear has no meaning. Till date, the ultras in state’s hinterlands decide whom the villagers will vote for. 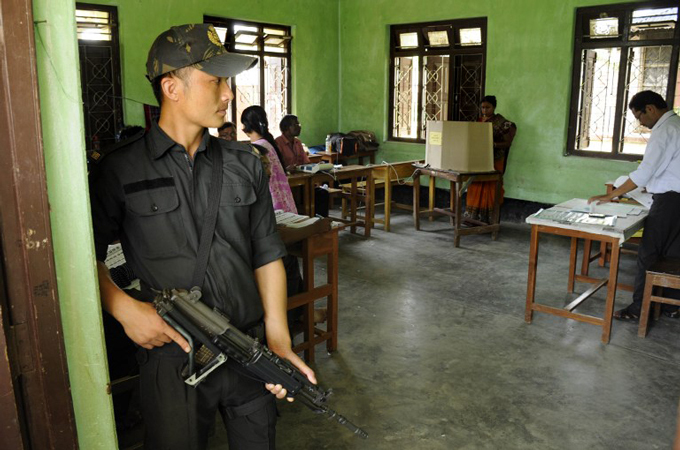 “Command jisko adesh deyga usko vote deynge (We will vote for that candidate for whom we get the command),” said a villager who identified himself as Mangra Munda from Murhu block of Khunti distrit, around 75 kilometers from the state capital. “We cannot vote at will. If we do so they (LWEs) will kill us,” said a villager from Beerbanki village in Khunti district. 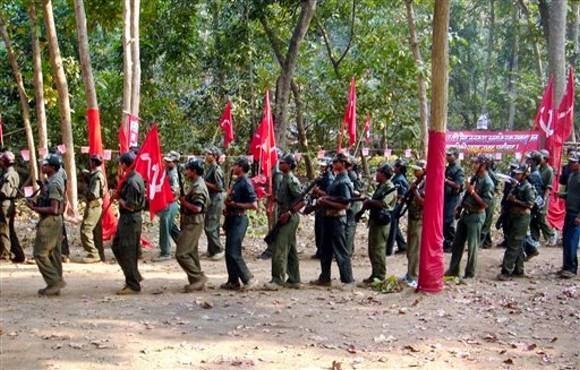 The village is regularly visited by cadres of CPI-Maoist and People Liberation Front of India (PLFI). In Jharkhand, more than 25 splinter outfits are active in the 22 LWE-affected districts. The state government has banned 17 outfits including CPI-Maoist, TPC, PLFI, TPC-2, Jharkhand Prastuti Committee (JPC), Sangarsh Jan Mukti Morcha, and Jharkhand Jan Mukti Party (JJMP). Despite heavy deployment of security forces in the state, banned Maoist outfits are managing to conduct meeting with villagers directing them to boycott polls or cast their vote in favour of a particular party leader. There are reports of several banned outfits holding meetings and giving diktats about whom to vote for in villages of the 13 constituencies — in Latehar, Chatra, Palamu, Garwa and Gumla districts — that will go to polls in the first phase on November 25 For instance, the Tritya Prastuti Committee (TPC) has ordered villages under its dominance to vote for a regional party; RJD leader Janardhan Paswan has filed a complaint with the election commission. Similarly PLFI has also passed its diktats in Khunti, Simdega and Chatra. Villagers explained that the “jungle party” (Ultras) issue diktats a few days before the elections. “The diktats are given to villagers only a day or two earlier,” said a journalist based out of Gumla. Sources added that political parties also seek support of the rebels to demotivate other candidates. The splinter outfits, in the area under their dominance, bar the opponents’ campaigning vehicles from entering. During the Lok Sabha elections, activist Dayamani Barla, who had contested from Khunti, had complained that her campaigning was being targeted by PLFI to promote another political party. When contacted by Hindustan Times, Jharkhand chief electoral officer PK Jajoria said the poll body would take strict action against “contestants or political parties forcing people to cast votes in their favours with help of ultras”. “Programmes are being held to motivate voters to cast their ballot without the fear of ultras,” he added. Bara Vikash, senior leader of CPI-Maoist said they not favouring any particular party. “We are against the system. We are asking people to boycott elections,” he said. Maoists allegedly tried to “mislead” the MI-17 helicopters that were flown to rescue injured CRPF personnel in Sukma district of Bastar on Friday. According to a source involved in Anti- Maoist operations in Chhattisgarh, the Maoists lit up “improvised” smoke candles to “mislead” the two choppers, one of which landed near Chintagufa village in Sukma district of Bastar and rescued five security personnel injured in an encounter with the Maoists. “It seems to have been a trap to get the chopper land at a wrong destination and abduct the crew members. Two MI-17 choppers were deputed to rescue the injured jawans. The Maoists may have burnt some wet leaves, which were emitting heavy smoke at two different locations near the spot of the encounter to mislead the choppers,” said the source requesting anonymity. “But the chopper landed on the exact coordinates where it was directed by the CRPF personnel present on the spot. The CRPF men lit the smoke candles after the chopper reached the exact spot and provided cover for its safe landing “, he said. The Maoists, however, opened fire on the chopper after it took off injuring two more personnel including the gunner of the chopper M.K.Tiwari. The second chopper was sent as a “back up” for the first chopper. Wing commander Sandip Singh was the pilot of the chopper, which came under fire from the Maoists. “Some CRPF doctors and three other chopper staff including Mr.Tiwari were on board the chopper,” said another officer working in Bastar. However, Mr.Tiwari denied “noticing” any smoke to divert the chopper route. “We were given perfect location coordinates and signals so we landed at the exact spot and were received by the CRPF IG. Even if there had been an attempt to divert the chopper route, we ignored it. There is no possibility of the chopper being misled just by smoke signals,” Mr.Tiwari told The Hindu. But a source told The Hindu, that Mr. Singh did notice smoke at two different locations after landing. Recounting a similar incident, a senior officer who was posted in Dantewada district of Bastar a few years ago said that the Maoists had once tried to “mislead” his chopper into Konta block of Bastar. “The Maoists had lit huge smoke to divert our chopper at a wrong place. But our men on the ground alerted us in time and we made our landing at a safe location,” claimed the officer. “Friday’s incident was a big trap. Had the Maoists been successful, it would have been their biggest success in many years,” said another officer privy to the anti-Maoist operations in Bastar. Despite firing by the Maoists, the MI-17 helicopter managed to safely evacuate the injured personnel to the Jagdalpur district headquarters. The Maoists had fired indiscriminately on another Mi-17 helicopter and had forced it to make an emergency landing near Chintagufa area of Sukma in January 2013. The CPI (Maoist) had circulated a booklet in 2003 among its military wing cadres instructing them on the ways of gunning down a chopper. The booklet Jang Ke Hunar (The Art of War) however, does not mention anything on the ways to divert the chopper. One police jawan was killed and five were seriously injured when the Maoists opened fire on a police team in Gadchiroli district of Maharashtra on Friday. The incident took place when a team of Jimalgatta police station, was rescuing the polling party of Dambrancha polling booth at around 1 pm, said Gadchiroli police. 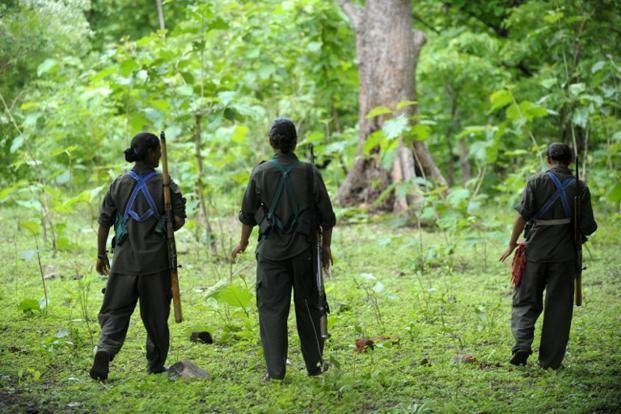 “Police team retaliated the fire and reinforcement was sent immediately, but the Maoists managed to escape taking advantage of thick forest. Here is the poster issued by the Italian Chapter of the International Committee to Support the People’s War in India, to launch a national-wide information campaign in the Boycott of Loksabha polls in India. The greatest People’s War in the World. Along with poster, the campaign begun with the translation of the Document of the CPI(Maoist) spoke-person on the boycott and will go on with publishing other documents and press reports about the boycott. Some media persons asked for an interview with Comrade Abhay, Spokes Person of CPI (Maoist) on some recent phenomena concerning our movement and our country. We are enclosing here the written answers of Comrade Abhay that were also given keeping in view the announcement of the schedule of 16th Loksabha elections by the Election Commission. This interview was released to the media on 24-03-2014. Q: The Election Commission has announced the schedule for the 16th Loksabha elections and doing all preparations on war footing to conduct these elections and every electoral party and alliance is completely engaged in deciding on whom to send into the ring. What is your party’s stand on various parties and alliances contesting in these elections? Do you welcome the NOTA option? 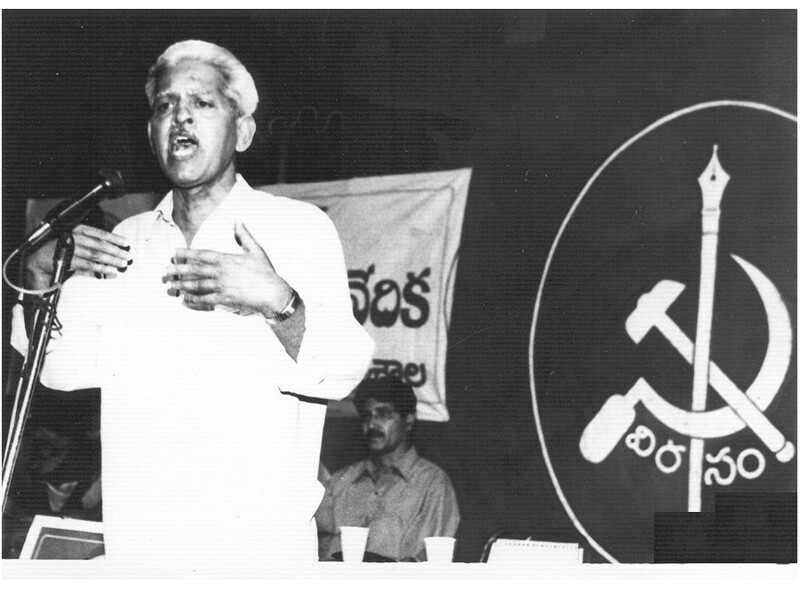 Denouncing parliamentary form of democracy as a convenient system propped up by the ruling elites to exploit the masses, revolutionary writer Varavara Rao has appealed to people to boycott the ensuing elections. Speaking at a Meet-the-Press organised by the Telangana Union of Working Journalists here on Monday, he said real democracy was only possible with revolution rooted in class struggle and in sync with innovation. Taking swipes at TDP, Congress, TRS and YSRC by branding them as bourgeois parties, Rao said that elections were for a mere change of guard and would not benefit the common man. With a new state of Telangana becoming a reality, he urged the upcoming governments in both the states to lift the ban on the Communist Party of India (Maoist) and mass organisations in 2005 and to disband the Greyhounds. He urged the central government to revoke the joint capital status given to Hyderabad and to stop construction of Polavaram irrigation project. “What right has the people of the mainland got to decide the fate of tribals? Polavaram project has to be stopped immediately to prevent the numerous clusters of tribal villages from submerging. The demands of tribals are as legitimate as those of Telangana people,” he claimed. He accused Narendra Modi of having a unholy nexus with numerous companies. “The huge support to Narendra Modi reminds us of the support Adolf Hilter had garnered in the 1930s,” Rao said. The shadow of Maoists got a bit longer on Sunday, when they held a ‘jan adalat’ (people’s court) to enforce the poll boycott call in their areas of influence. The ‘court’ was held in Jamui, from where Lok Janshakti Party chief Ram Vilas Paswan’s son Chirag, a former actor, is contesting his first election against Bihar assembly speaker Uday Narain Choudhary, a JD(U) nominee who has been accused of having links with the Maoists. Sources said at the ‘jan adalat’, held in a forest area close to the Vishunpur village in the so-called red corridor, the ultras threatened people against casting votes in the poll. According to sources, a group of Maoists, led by a local commander, Pargati, held the Jan Adalat in the outskirt of a village while another squad barricaded the village. Earlier, the Maoists put up posters and banners in Sono, Jhajha, Simultala, Khaira, Sikandara and other villages, threatening the local residents to stay away from elections and instead assert their rights over forest, water and land. Make the New Democratic Revolution successful! The building of an Indian people’s democratic federal republic based on genuine democracy and self-reliance is the only alternative! 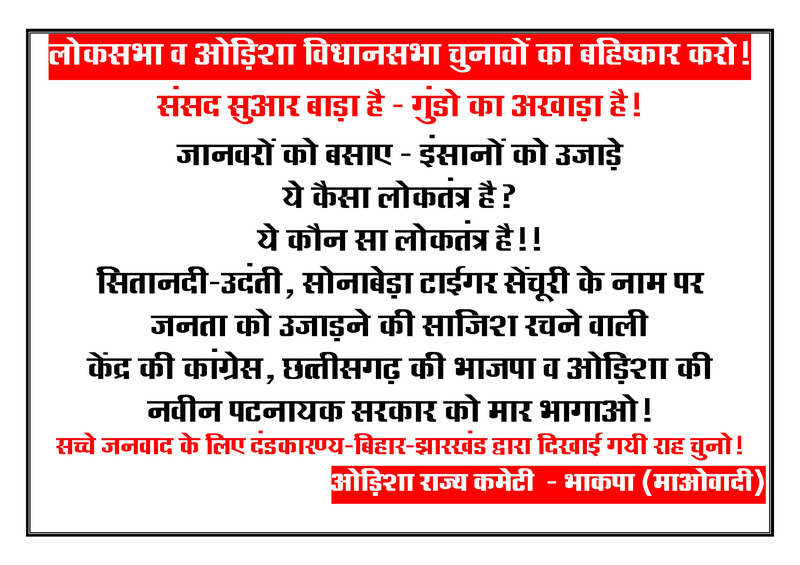 GADCHIROLI: The Naxals have started pushing their rhetoric against the Lok Sabha polls through banners and posters. A Naxal banner, put up by Darekasa area committee under North Gadchiroli-Gondia division of Maharashtra state committee, was seized in Gondia district on Sunday. The rebels have called for boycott of the polls on April 10. 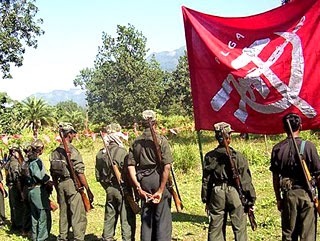 Though the Naxals are known to oppose democratic systems in general, the rebel banner has specifically appealed to the masses to boycott polls in their stronghold, Gadchiroli Lok Sabha constituency, which also comprises Amgaon (Gondia) and Chimur (Chandrapur) assembly constituencies.